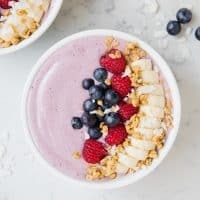 This breakfast bowl is one of my favorites! It is a great way to start your day, or finish it! Combine the yogurt, milk, berries, banana, peanut butter, strawberry jam and protein powder into a blender. Blend until smooth and creamy. Pour into 2 large bowls or 4 small bowls. Top with your favorite toppings such as bananas, berries, granola and coconut.